Register Log In AmbergrisCaye.com Home Forums News Penner "Can't Recall"
So, as you saw, Senator Courtenay was determined to ask his questions about Citizen Kim, and he did. 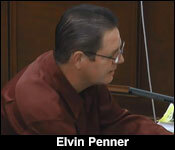 The line of questioning started with Elvin Penner refusing to answer, and later on, his answers changed with him asserting that he could not recall. "The evidence before this committee is that you took or you went along with whichever way it is, an Asian gentleman in a black suit to the immigration department, do you recall in September 2013 going to the immigration department with an Asian gentleman in a black suit?" "At this point in time I will invoke my right under the laws of Belize to remain silent." "Mr. Penner why are you refusing to answer that question?" "Because I believe I have the right to do so." "Mr. Penner do you know Omar Phillips?" "I would only know him through the fact that his name has been mentioned in the report." "You do not recall that he worked at immigration department when you were minister of state?" "No I do not recall." "Do you recall ever having contact with him at the immigration department work wise?" "He has testified before this committee that you came along with an Asian gentleman wearing a black suit in September 2013. Is that testimony of Mr. Phillips true or false?" "That is his testimony so I would not able to say if it is true or false because that is the testimony that he made." "Well did you go in September 2013 with an Asian gentleman wearing a black suit to the immigration department?" "Again I invoke my rights under the laws of Belize to remain silent." "Mr. Erwin Robinson immigration officer, you knew him when you were a minister?" "He testified that a gentleman came to the immigration department and he took a picture of him who was supposed to be Wong Hong Kim. My question to you is are you aware that someone being an Asian person was taken to the immigration department purporting to be Wong Hong Kim for the purpose of his picture being taken by Mr. Robinson." "No I was not aware of that." "No you are not aware of that. Do you know Gordon Wade?" "Do you recall Mr. Wade - you going to Mr. Wade's office at the immigration department and inquirying about the file relating to Wong Hong Kim?" "Again I will invoke my rights under the laws of Belize to remain silent." "Mr. Wade indicated that he informed you that the application was incomplete of Wong Hong Kim and you asked for the file so that you would take it to director Maria Marin. Do you recall that?" "I do not recall that." "Do you recall a conversation with Mr. Wade at all about the Wong Hong Kim file?" "Would Mr. Wade's evidence, would his evidence be truthful about that conversation he had with you?" "Like I'm saying I do not recall that conversation so I could not say." "Do you recall receiving the file and taking it to director Maria Marin?" "Have you ever been in possession of the application form and the file for Wong Hong Kim?" "I was actually had to been because I signed that nationality certificate." "Right, do you recall having possession of the application form prior to his nationality being granted?" "As far as I can recall I never did had possession of that specific file prior to it have been brought to me for signature." "For the purposes of the certificate?" "So anybody who said that prior to that, that it was given to you would be lying?" "As far as I can recall yes." "Did you at all participate in facilitating the grant of nationality or a passport to that gentleman?" "In terms of the passport yes I signed the recommendation form." "I signed the nationality certificate." "Prior to that those two official documents, were you involved in anyway facilitating processing, arranging for the application form to be processed - the picture or any data to be captured?" "I would not know that because I don't recall." "Can you read paragraph 7.15, this is referring to an interview with Ms. Ady Pacheco." "She answered yes she received his application said that application was brought in by Mr. Penner." "They were interviewing Mr. Wade and Ms. Pacheco and both of them essentially and if you disagree with it and want to verify it please do so but essentially they were saying that the application was brought in by you for Wong Hong Kim, you visited Mr. Wade, Mr. Wade indicated that it was incomplete. You spoke with Ms. Pacheco, you followed Ms. Pacheco into Mr. Wade's office and you said listen you will take the file to the director and have it dealt with at that level. I am simply drawing to your attention the specific parts in the report to jog your memory." "And the question basically is do you not recall any of this? You are not able to say to us whether or not these persons are telling the truth or not?" "I will not be able to say that." "So you recall ever going to the nationality department with Wong Hong Kim with who you say you know?" "You've said to us you confirmed that you've never met him in Belize. To your knowledge was he ever in Belize?" "So again I'll go back to the question so should we assume that it was not Mr. Wong Hong Kim who went to the department to apply for a passport?" "I don't think we need to assume, I think it's obvious that it was not." "I just wanted to get the answer clear." We'll have more from today's Senate Hearings in which you'll hear Penner take questions on the UDP rush before the 2012 General Elections to get persons naturalized as Belizeans. So, with all that antics aside, we turn now the real business of the day. Elvin Penner was called back to take a few more questions from the Senate on the part of the Auditor General's report for which he was named. More specifically, however, the Senators wanted to take a second attempt to get him to answer to the Citizen Kim scandal. Last week, we showed you how how he tried to claim rights and privileges in the constitution which he said excused him from taking their questions. "Responses during last week sessions were I exercised my right to remain silent on a case to case basis with regards to certain question, this right is to addition to whether I am or am not exposed to further penalties section 14:1 of the very law governing these proceedings. The legislative assembly and powers privilege states that I have the same rights and privilege as before a court of law. Everyone is aware of the inherit right of any accused even in case of accused murders to remain silent throughout an entire trail if he or she wishes and he or she cannot be penalized for that." "On the last occasion you said because of the exposure of the previous matters you would not answer questions related to those matters which I could not understand with legal principle behind that so you're changing that now, you're saying that the constitution affords you the right to not say anything?" "I am indeed indicating that the constitution does afford me to not say anything." "Where in the constitution affords you that right?" "I don't have a copy of that section of the constitution with me, I don't recall exactly what the constitution read but that is my understanding and that is why I'm stating that today." "I just want to get Mr. Penner clear saying that the constitution affords you a right to now answer questions put by this committee to you without giving a reason?" "Well I am giving the reason to the best of my knowledge at this point in time." "Which is what that the constitution says so?" "That the constitution says so." "That you can just remain quite?" "There is no section in the constitution that says that. I am asking that Mr. Penner identify the specific section of the constitution that he is saying gives him the right to not answer a question without giving us a reason because there is none and we need to know right now whether Mr. Penner is going to disrespect this committee." "You are relying on appropriate legal principles but in an inappropriate way, I say that with respect. This does not say that a witness or a person before a court does not have to answer - a compellable witness. At this point you are a compellable witness because you have been summoned to be here. This section which you relied upon erroneously does not say that you have to answer any questions it says that the question put to a witness which in the opinion of the judge may expose him to criminal proceedings or penalty if the judge deems fit that person can be excused from giving an answer. So it doesn't give that blanket protection that I told you about on the last occasion, likewise I think that you are also a bit misguided when you put yourself in the position of an accused, when you use this same section 13 and say that an accused is not forced to say anything, now that is in the constitution but if you are a person before a court it doesn't mean that you are an accused. Witnesses also appear before a court so you are in the position as a witness before a court not an accused." was fully aware of the questions in regards to cabinet discussions were perhaps not legally permissible in this setting, he never the less proceeded to pose them, one can therefore only speculate as to the true motives in this particular line of questioning therefore begs the question what's the senator's intent on casting aspersions on the current administration instead of actually filly the terms of reference of this committee. It is my further opinion that Senator Courtenay has really proven to me and to the vast majority of the listening public that this hearing has become a platform for him, a political platform not only to undermined and discredit past and present ministers of the UDP administration but also to do likewise to career public officers, I believe that he's also making every effort to represent his party in this senate to the best of his ability. Let the record show that I do not intend to answer any further questions which in my view are posed with over political biased. Please bear in mind always that I freely accepted the invitation to appear before this committee with the sole intention to assist in the fulfilment of its noble role. During last week's sessions I was also asked a question by Senator Courtenay implying that I wrote hundreds of recommendations, I'm sought clarity to this statement at the time knowing that for a fact I did no such thing, I'm absolutely sure that of all the letters of recommendations signed by me would be collected, it would amount to nothing to 100. I am hence again willing and ready to provide answers to any questions put to me today as long as I am convinced that the questions are legally permissible, relevant to the special report of the Auditor General and where I am legally required to ask such questions. This position is far more open than my legal right to remain silent throughout this whole proceeding with no fear of any penalty, thank you." 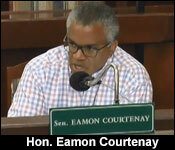 "Senator Courtenay you had questions for Mr. Penner?" "I had but I guess I will get a lashing this morning from my daddy. Mr. Penner you're paying attention or are you texting? Let me just say something to you right for the record. Nothing that you said just now frightens me or will change the questions I have for you, alright? You know why I am here, you know why you are here and as long as we keep that in mind we won't be here for too long but believe me I will ask you the questions that I have because you were the one who was volunteering all along that you wanted to come here and tell this senate committee all that you know about the scandal of the immigration department. All of a sudden for some reason you are now coming up with reasons why you do not wish to answer questions. I have some questions for you and I hope that good sense will prevail and you will answer them."